Happy Thanksgiving week! The temperature might be dropping in NYC, but families in the city are gearing up for the “warmest” family season of the year. This is a great chance to use the long weekend to take in one o the many holiday activities and theater shows in NYC. Take your kids to see Clifford the Big Red Dog celebrate his 50th Anniversary or stop by the American Museum of Natural History to watch the balloons get inflated before the Macy’s Thanksgiving Day Parade. You can also venture off to Narnia or take in Afro-Cuban sounds right in NYC. Here are our picks for the week ahead. Nothing says that the holiday season has begun quite like the Macy’s Thanksgiving Day Parade. The balloons alone are bigger than any other parade in town. Families will enjoy giant, inflated balloons of pop-culture icons, floats, performers, marching bands, clowns and special performance groups. Some of the fun balloons include Adventure Time with Finn & Jake, Diary of a Wimpy Kid, Hello Kitty, Toothless of How to Train Your Dragon, Paddington and Pikachu. Also, Questlove will join the cast and Muppets of Sesame Street for a special performance on the Sesame Workshop float. The parade begins at 9AM and runs until noon. That gives you plenty of time to head home and enjoy your evening feast. The parade route starts at 77th Street and 8th Avenue. It travels south until 59th street, where it turns east and heads south along 6th Avenue. The parade ends at Macy’s in Herald Square. Clifford the Big Red Dog Live! This is the 50th anniversary of Clifford the Big Red Dog. On Sunday, November 29, take your kids to see Clifford at the St. George Theatre. Families can sing along to this new musical as Clifford, Emily Elizabeth and their friends from Birdwell Island embark on a fun adventure. This is an interactive show that taps into the Clifford’s timeless values or sharing, telling the truth, respecting others and working together. Tickets are $19 and $29 dollars. The show begins at 2pm. Doors open at 1PM. You can purchase tickets directly through ticketmaster. While the Macy’s Parade is the hallmark of Thanksgiving festivities in NYC, many families have to enjoy a smaller, related event. The afternoon before Thanksgiving, families will venture out to the American Museum of Natural History to watch many of the parade’s giant balloons get inflated. If you want a sneak peak of Ice Age’s Scrat and his acorn, the Red Mighty Morphin Power Ranger, Angry Birds’ Red and other popular characters, then this is a must-see event. The fun begins right after school. So you can watch the inflation between 3PM and 10PM on Wednesday, November 25. Balloons will be inflated at 77th Street and 81st Street, between Central Park West and Columbus Avenue. Macy’s recommends that you enter through the 79th and Columbus Avenue area. Get ready for a journey to Narnia. On November 27, Queens Theatre will present a special 60-minute performance of The Lion, the Witch and the Wardrobe. In this story, four children enter a magic wardrobe and are transported to a magical land, where a cold-hearted White Witch has made it winter year round. Needless to say, for New Yorkers who experienced this past winter, that’s freakish concept to consider. The show is designed for kids, ages 6 to 12. Tickets are $14. The latest Pixar movie is here. Hot on the heels of the Inside Out Blu-ray release, Pixar will be releasing its latest animated feature, The Good Dinosaur, on November 25. Pixar continues to be at the forefront of animated feature films on the big screen. In this story, Pixar explores a world where the dinosaurs didn’t become extinct. 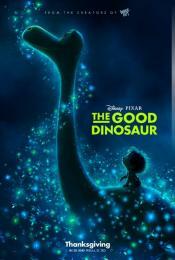 It follows an Apatosaurus named Ario who makes an unlikely human friend. This should be a fun film to take in over the holiday weekend. It’s Nutcracker season! If your children have yet to see a Nutcracker performance, consider checking out the NYC Ballet’s show. George Balanchine vivid choreography and the wonderful sets and costumes really make this a memorable performance. Young children will the onstage blizzard as well as an enchanted Land of Sweets that would give Spongebob’s imagination a run for its money. George Balanchine’s The Nutcracker runs from Nov 27 through Jan 3, 2015. Tickets range from $40 to $265. The performance is 2-hours long. With train shows and holiday fairs lighting up your pockets, you should also take a chance to kick back with the family and enjoy one of the holiday theater shows. On Nov 28, “Fancy Nancy’s Splendiferous Christmas” will open up at The Theater at St. Jean. The show is adapted from the children’s book written by Jane O'Connor and illustrated by Robin Preiss Glasser. In this play, Fancy Nancy imbues Christmas with her larger than life personality. The show runs on Saturdays and Sundays through December 27 at 1PM. Regular tickets are 49.50 and premium tickets are $59.50. The show is ideal for ages 2 to 7. If you’ve ever wanted to experience the beauty of Afro-Cuban music and dance, but haven’t had the chance to visit Havana, Cuba, here’s your chance. November 29 will be the last chance to enjoy Lizt Alfonso Dance Cuba at the New Victory Theater in 2015. In this show, 18 dancers work together to fuse flamenco, cha-cha, rumba, ballet, salsa, bolero and congo. It’s an ambitious show with physical finesse and lots of good vibes. The show is 95-minutes long with one intermission. It is ideal for groups with kids ages six and up. Some performances will allow families to join the performers on-stage after the show. Ticket prices start at $15. November 29 is your last chance to enjoy, Mimirichi, a Ukrainian children’s theater troupe, appearing at the Theater for the New City. The show may be ne of the wildest interactive shows that you’ll have a chance to see. In this show, three comedic improvisers will build a paper city and then tear it down with the help of the audience. The three-person group is something of Three Stooges group with its fast-paced slapstick comedy. If you have kids that like to build things or kids that love to build things and then tear them down, then this is for you. The show is designed for kids ages four and up. There are tickets available for $45, $55 and $65.